Two molecular agents designed to image angiogenesis—the rapid proliferation of blood vessels typically associated with malignant tumor development—may provide new cancer management tools. The imaging agents each employ specific biomarkers to detect proteins that consistently accompany rapid blood-vessel growth. Results from a study at Stanford University Medical Center may eventually provide clinicians with new tools for breast cancer management, according to Andrei Iagaru, MD, lead study author and an assistant professor of radiology and nuclear medicine at the medical center. The new imaging agent, 18F FPPRGD2, combines the medical isotope fluorine-18 (18F) with a protein biomarker that images the expression of αvβ3, a key integrin involved in angiogenesis. When injected, the investigational agent seeks out tissues in a state of angiogenesis, and then the fluorine isotope shows up on a PET scan. 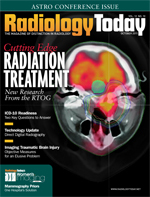 “We believe that PET imaging with this agent could potentially provide earlier identification of patients with progressive cancers and give clinicians better information for determining whether a patient is an ideal candidate for aggressive therapy that could result in an improved prognosis,” Iagaru says. The Stanford study recruited six female participants with breast cancer and imaged each of them twice within two weeks—once using the new agent and once with 18F FDG PET/CT, the standard agent for tracking glucose uptake. According to the study, PET imaging with 18F FPPRGD2 showed superior functionality for identifying angiogenesis in breast tissue, with strong uptake and distribution in both primary cancers and metastatic lesions. In separate work, researchers at the University of Wisconsin-Madison’s School of Medicine and Public Health are pursuing another method for tracking angiogenesis. The Wisconsin team conducted a preclinical study aimed at using PET to image the expression of endoglin, or CD105, a naturally occurring glycoprotein on cell surfaces. Above-normal expression is associated with poor prognosis in more than 10 solid tumor types. Pathologists evaluate tumor angiogenesis with a process called microvessel density analysis on tumor tissues obtained by biopsy or surgical removal. Clinicians stain CD105 in those specimens to measure the amount of vascular proliferation. The preliminary data from this study raise hopes for noninvasive imaging of CD105 expression using PET. The research team used the medical isotope copper-64 (64Cu) to label an antibody called TRC105, which is currently being studied in a U.S. multicenter phase 1 human study. TRC105 binds to CD105. This study demonstrates 64Cu-DOTA-TRC105 as a highly effective PET imaging agent for gauging tumor angiogenesis. Results showed rapid and persistent CD105-targeted uptake by tumors in mice. Weibo Cai, PhD, an assistant professor of radiology, medical physics, and biomedical engineering at the university believes that molecular imaging like this represents critical early steps in the emerging science of personalized medicine. The first practical application for tracking the overexpression of CD105 is certainly that of evaluating tumor-related angiogenesis, but other applications may be found for other disease states characterized by elevated angiogenesis—namely heart attack, stroke, and atherosclerosis. In fact, molecular imaging of this protein could eventually lead to expanded tools for detecting and treating any number of diseases characterized by enhanced angiogenesis. — Timothy W. Boden, CMPE, is a freelance writer based in Starkville, Miss. He has spent 22 years in practice management as an administrator, consultant, journalist, and speaker.